Faculty of Engineering Universitas Muhammadiyah Yogyakarta warmly welcomed a cooperation visitation of Universitas Langlangbuana (UNLA) Bandung, Friday (7/4), in Amphitheater Room 5th floor, KH Ibrahim building. This visitation was a continuum from UNLA’s first visitation a month prior. 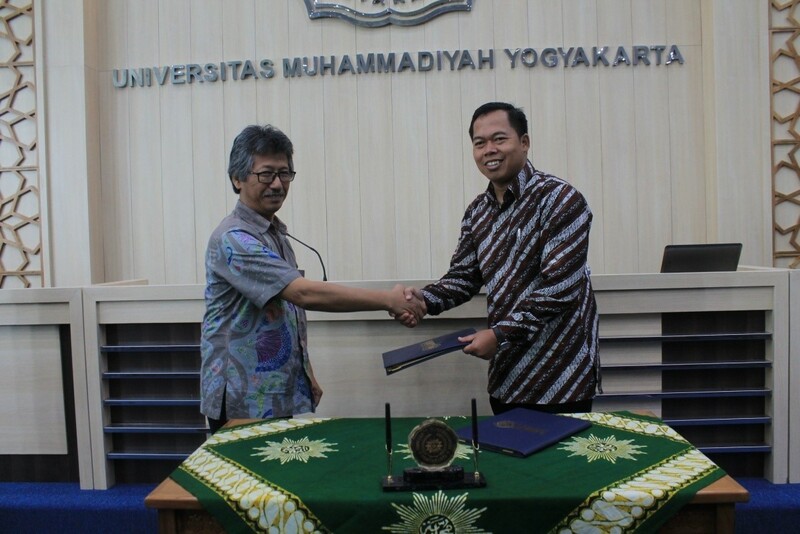 Represented by Jazaul Ikhsan, S.T., M.T., Ph.D as the Dean of Faculty of Engineering UMY, both institutions followed up their cooperation by signing Memorandum of Understanding (MoU) with The Dean of Faculty of Engineering UNLA, Dr.-Ing. M. Hendayun, as their representative. Both Universities agreed to sign MoU in the matter of academic, like education quality improvement to prepare both institutions to produce innovative and creative graduates who are able to compete in Free Market of Asean (AEP) Economics People. Stated by Jazaul Ikhsan, this cooperation is a good opportunity to support each other to improve the academics matter. “The first step that we can do is to collaborate to cover each other weaknesses with our strengths from both parties. In the matter of academic, we hope that this cooperation can give advice or input for Students Creativity Week based in the review of UMY.” he said. Dr.-Ing. M. Hendayun concurred with Jazaul Ikhsan. He said that this cooperation will be a good strength to build each institution together as the needed point to prepare AEP. Written in both MoU signed by these two institutions, the cooperation is to increase and to develop qualities possessed by each institution. By this cooperation, it is hoped that each parties can cover the society and nations’s need as well as contributing in the development of science and technology. In this MoU, both institution agreed to have a cooperation in the matter of the quality development of academic, research and community service.